Powers/Abilities: Hummingbird is empathic and telepathic; she can sense others' emotions and access their memories. She can induce intense emotions, especially fear, in others. She can levitate, and frequently does so in her sleep. She can also apparently make her skin turn green. While under Huitzilopochtli's influence, she can project bursts of divine fire. She apparently has a rapid metabolism (like a hummingbird), which allows her to metabolize drugs and toxins quickly, but requires her to consume more food than her small size would suggest. She is a native Spanish speaker, and has learned a number of languages via telepathy, including English, French, Japanese, and Romanian. History: (Scarlet Spider II#14 (fb) ) - Young Mexican girl Maria Aracely Josefina Penalba de las Heras may or may not have been the reincarnation of the Aztec god Huitzilopochtli. (Scarlet Spider II#15 (fb) ) - To fulfill a prophecy and make Mictlan (the Aztec underworld) rise, the enigmatic Coyote apparently had Aracely's parents killed, and put her in with a truckload of illegal migrants the Lobo Cartel had sold to Roxxon for human testing. He ordered his men to leave the truck to bake in the desert sun for a day before taking it to Houston. As the rest of the people in the truck roasted alive, Aracely survived, but the trauma rendered her amnesiac. As she suffered, she heard a voice that promised her she would survive this ordeal - and that afterwards, she would make the world bleed. (Scarlet Spider II#2) - Aracely fled the Salamander, but he cornered her. Amused that she had no idea why he was going to kill her, Salamander prepared to land the final blow, but Kaine arrived, in a purloined Spider-Man costume, and took on the Salamander. The Salamander soon set him on fire; the Salamander pursued her again, and she fled, running into Kaine, who had been extinguished by the hospital's sprinklers. He tackled the villain out the window and defeated him in the streets of Houston, away from the hospital. Aracely returned to her bed, and began to recover. Kaine visited her that night, and was told by Dr. Meland and his husband, police officer Wally Layton, who told him that, as an illegal, she would be deported back to Mexico, where her enemies could find her - and that while the police couldn't do anything about it, a vigilante could. Kaine left, but after a short time he returned to take Aracely away to his hotel penthouse. 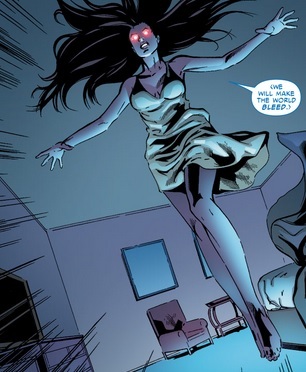 (Scarlet Spider II#3) - Aracely awoke in the hotel room; confused by her new surroundings, when Kaine and hotel bartender Annabelle Adams (who Kaine had asked to help, as she spoke Spanish) came in through the door, Aracely attacked them with a wine bottle. Luckily, Dr. Meland soon arrived, as well, calming her down. (Scarlet Spider II#4) - Annabelle took Aracely shopping at the Houston Galleria mall. While excitedly picking out clothes, she told Annabelle that she could sense Kaine (who was fighting the Assassin's Guild) - in perfect English. Back at the hotel, Aracely demonstrated that she could speak a number of languages, including French and Japanese; when a news report came on TV about the new "Scarlet Spider", Aracely correctly identified him as Kaine, much to Annabelle's surprise. (Scarlet Spider II#6) - Aracely found Kaine coming out of a tattoo parlor, and asked him to go get barbecue with her. As they ate, she babbled on about her psychic abilities, how she sensed the darkness that was coming for them all, and why she'd started wearing a blue hoodie - she was aware that it invoked strong feelings in Kaine, but didn't realize it reminded him of his dead clone "brother" Ben Reilly. None of this dampened her relentless cheerfulness. (Scarlet Spider II#7) - Kaine spent the day with Aracely at the hotel, swimming, going to the spa, and watching TV; all the while, he was trying not to care about his recent encounter with Zoe Walsh, a woman he'd rescued after she'd tried to blow up Roxxon's Houston offices. That night, his attempts to not care finally prompted Aracely to burst into his room, yelling at him to do something because she couldn't sleep with all his not caring. 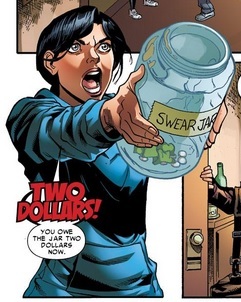 (Scarlet Spider II#12) - On Christmas Day, after a nightmarish experience with Carnage, Kaine profanely declared that he was going to leave Houston and escape to Mexico, but Aracely blocked him from leaving his hotel suite - and demanded that he put two dollars into the swear jar. Kaine, having had three beers, collapsed; while Aracely and Officer Layton tried to drag him to bed, a hotel employee came to tell them that they'd have to leave their suite, as the Belgian ambassador had a reservation. As Layton and Dr. Meland discussed how they could make Kaine stay, Aracely demonstrated the self-repairing nature of Kaine's costume. When they learned that Annabelle was being held hostage in the lobby by the Santa Claus Bandits, Aracely tried to wake Kaine up; when that failed, she headed downstairs with Layton to help. While he confronted several of the thieves, she went after one of their number, Kris Kringle. When he pulled a gun on her, she used her powers to paralyze him with fear. Later, after the Scarlet Spider defeated the rest of the bandits, the hotel's manager asked him if there was anything he could to to repay him; Aracely whispered that Belgians should be banned from the hotel forever. Kaine repeated it and the manager complied, allowing Kaine and Aracely to stay. That night, Kaine, Aracely, Layton, Meland, and Annabelle celebrated on the hotel roof. (Scarlet Spider II#12.1) - Kaine checked in on Aracely as she slept. (Scarlet Spider II#13) - Aracely dreamt of an idyllic life in Aztlan, only for it to be destroyed as Mictlan rose. She saw a man and woman who she recognized as her parents killed; soon, she herself was attacked by the Salamander. Making up with a start, she was comforted by Annabelle, and then went to see Kaine. She explained her dream, and insisted it was more than a dream. They were then confronted by the Mexican cartel bosses Carlos and Esmerelda Lobo, who offered to let Kaine escape if he gave them Aracely. He instead grabbed Aracely and fled, as the Lobos gave chanse in their werewolf forms. The Lobos soon caught up with them, and Aracely escaped as Kaine battled them. She could feel his death as the Lobos defeated and devoured him. (Scarlet Spider II#14) - The Lobos pursued Aracely into an alley. She probed into Carlos' mind, and tried to exploit his fear of dying as his brother had. He almost reverted to his human form, but the stronger-willed Esmerelda snapped him out of it while Aracely fled to Houston's Third Ward, deliberately leading the Lobos into the Shark gang's territory. To delay them, she asked what they wanted from her, and who she was; Esmerelda told Aracely her full name, and her allegedly divine nature - and that their patron, the Coyote, wanted her dead. Esmerelda considered leaving her alive as a bargaining chip, but Carlos insisted that they kill her - before they could come to a decision, the Sharks attacked. Aracely slipped away in the confusion, although not before one of the Lobos slashed her on the back. (Scarlet Spider II#16) - After another night of sleep-levitation, Aracely went to the Houston rodeo with Meland, Layton, and a very reluctant Kaine. After telepathically probing rodeo star Wyatt Taft, she declared him to be dreamy. Later, when Kaine rudely refused Annabelle's romantic advances, Aracely yelled at him until he ran to apologize. The subsequent rodeo, in the Scarlet Spider rode a horse while fending off a drunken, lovesick Armadillo, then kissed Annabelle, was declared by Aracely to be the best rodeo ever. (Scarlet Spider II#17/Scarlet Spider II#18 (fb) ) - When Kaine was dispatched to New York by the Assassins Guild to kill Wolverine, Aracely pleaded to go with him; Kaine had anticipate this, and had already acquired a fake passport for her (under the name Angela Maria Lopez). He was giddy the entire plane ride, and excitedly pointed out Spider-Man swinging by as they took a limo to their hotel. Aracely, clad in a new costume and calling herself "Hummingbird", tagged along with Kaine to Westchester. They had no intention of actually killing Wolverine, but with an Assassins Guild killer watching the mansion, they had to make it look good. To kick off their mission, she walked up to the front door of the X-Mansion and knocked; when the janitor Toad answered, she used her powers to terrify him, and he ran off, allowing her and Kaine (rendered invisible by his costume) unimpeded access to the school. She soon ran into Rachel Grey, who trie to telepathically probe her, unintentionally unleashing Huitzilopochtli from within her psyche. The resulting psychic shockwave hit the other telepaths in the school (including Kid Omega, Blindfold, and the time-displaced Jean Grey), and alerted the X-Men to the intruders. Hummingbird quickly regained control and apologized to the near-catatonic Rachel. She did manage to communicate their situation to Jean Grey, who telepathically told Wolverine to play along. When Kitty Pryde, who had cornered Kaine, saw Hummingbird standing over her prone teammate, it gave Kaine an opportunity to knock her aside and carry out his mission - stabbing Wolverine in the heart. (Scarlet Spider II#19) - When the Beast contacted Kaine and Wolverine after they'd defeated the Guild, Aracely cut into the call with her usual ebulliance. Beast insisted that Wolverine hurry back. (Scarlet Spider II#20/2) - Aracely met Kaine when he came back from a subsequent trip to New York. (Scarlet Spider II#21) - Convinced that he was suffering from clone degeneration again (thanks to a hallucinogenic dart from Kraven the Hunter), Kaine wrecked the hotel suite in a rage. Aracely tried to telepathically calm him, but she encountered the Other in his mind and went into shock. Later, as she tried to reach out to him as he fled through the city, Ana Kraven broke in and subdued her. (Scarlet Spider II#22) - Aracely awoke at the Houston Zoo, where Kraven explained how he had died and returned to life, and how he needed Kaine to kill him. When she tried to use her powers on him, he slashed her across the face with a drugged knife, knocking her out. He then brought her and his other captives (Annabelle, Meland, and Layton) to an enclosure, where he demanded that Kaine kill him, lest he kill them all. (Scarlet Spider II#23) - Aracely remained unconscious for the duration of the fight, during which Kaine killed and revived Kraven. When she revived, she found that Dr. Meland had been critically injured. Later, she visited him in the hospital. (Scarlet Spider II#25 (fb) ) - Everyone in the suite was thrown clear of the explosion, but Aracely and the others found themselves plummeting to the ground. Kaine saved them all with a web, then had to face the ravenous Shathra. He had to transform into the Other to do it, terrifying Annabelle. Layton told Kaine he'd let him go, but he had to leave; Aracely left with him. (Scarlet Spider II#25) - Kaine and Aracely left for Mexico, where they intended to find her parents; once they crossed the border, Aracely's visions stopped. They took down a gang of drug dealers in Monterrey as the Scarlet Spider and Hummingbird. While Kaine took their money, Hummingbird instilled the sole conscious criminal with a fear of guns and a love of puppies. Later, while driving, they got lost, thanks to Aracely's inadequate navigational skills. As they camped out that night, Aracely tried to get Kaine talk about what had happened in Houston, but he refused. (New Warriors V#2) - Kaine and Faira battled until Hummingbird stopped them, having sensed that the Atlantean hadn't killed the others. She told them that an Atlantean/Deviant battle had been attacked by the powerful Evolutionaries, who sought to cleanse humanity of the genetically impure. Faira asked the two to come to Lemuria's aid, but Kaine wasn't interested - until the Evolutionaries chose that moment to surface and attack. (New Warriors V#3 (fb) ) - The Evolutionaries defeated all three heroes. (New Warriors V#3) - The Evolutionaries brought the three defeated heroes to the High Evolutionary's Mount Wundagore citadel for study, placing them with fellow captive Nova. Regaining consciousness, the talkative Hummingbird soon learned that Faira was the Water Snake, and she was on a quest, and that Nova had been to space. As the others responded with confusion, Kaine summoned a swarm of spiders to short out the machinery keeping them captive, freeing them. Before they could regain their bearings, they were soon set upon by an army of Evolutionaries. Hummingbird soon fell before their concentrated assault, and the others soon followed. (New Warriors V#4) - The High Evolutionary commanded the Evolutionaries to execute Hummingbird and the others, only for Justice to arrive with his allies Speedball, Sun Girl, and Haechi. Hummingbird was thrilled to be part of a super hero team, and soon the battle was joined. The heroes took down the Evolutionaries, but soon the High Evolutionary activated the Gene Bomb, a device that was designed to kill any human with super powers. Hummingbird and the others were incapacitated by it, leaving Sun Girl (whose powers were technology-based) to destroy it. When the angry High Evolutionary confronted her, Hummingbird and the others recovered in time to stare him down. He and the Evolutionaries fled, leaving the heroes with his abandoned citadel. Justice proposed that they form the new New Warriors, but only Hummingbird enthusiastically agreed. (New Warriors V#5) - Suspecting that the villagers around Mount Wundagore might be in trouble, Hummingbird, Speedball, Sun Girl, and Haechi went down to help. They burst into a local tavern, but Hummingbird found that its inhabitants were unharmed, and largely used to strange occurences on Wundagore. Instead of going back to see the others, the four decided to stay for a meal. As they ate, they got to know each other. Aracely explained what she knew of her own origins, then innocently began prying into the darker areas of Speedball's history she'd gleaned from his mind - the destruction of Stamford, Connecticut and his subsequent stint as the masochistic Penance. Speedball insisted that he was fine, but this put a damper on the conversation, and they soon returned to the citadel. There, Hummingbird was delighted to find out the rest of the team had befriended the surviving New Men Jack Waffles and Mister Whiskers, and confided to Sun Girl that she had fallen in love with the "dark and brooding and angsty" Speedball. Jake Waffles then demonstrated the citadel's teleportation functions by transporting the entire mountain into New York Harbor. (New Warriors V#6) - Hummingbird was excited to be in New York, but the Avengers soon came to investigate the mysterious mountain. While Justice and Speedball explained the situation to Captain America and Iron Man, Thor was assigned to watch over the others. Hummingbird asked to see if she could lift his hammer, but was shocked when Water Snake (under the influence of the Darkhold Dwarf, agent of Chthon) attacked Thor, prompting him to battle all the Warriors. Hummingbird could sense his presence in Water Snake's mind, and used her powers to make him visible to the others. 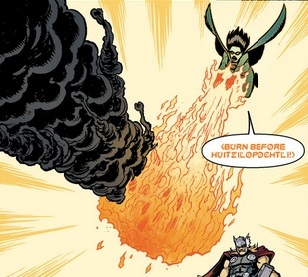 When he tried to possess Thor, Huitzilopochtli took over Hummingbird and blasted him with divine fire, incinerating him. She quickly regained control, and Thor and the Warriors celebrated their victory; Thor even let Hummingbird try to lift his hammer, which she could not. (New Warriors V#8) - Nocculus' thralls attacked the Warriors; as the others tried to get to the top floor of the building, where their friends were being held, Hummingbird found out that the humans were being mind-controlled, and used her powers to break his control. Joining the others on the top floor, she confronted the Inhumans who had kidnapped their friends. She took on Nocculus, who was paralyzed with terror when his third eye saw the divine entity within her mind. She then watched as the Inhuman revolutionary Lash killed the kidnappers' ringleader, Hollow, and departed. (New Warriors V#9) - When the Scarlet Spider disappeared, Hummingbird reassured the other Warriors that he would be fine; she insisted that Haechi was the one they should worry about, as he now felt that all his loved ones thought he was a monster and his own Inhuman people had tried to kill him. She suggested they take Wundagore to Prauge to go to a rave to distract him, and they agreed. There, they had trouble getting in, due to the obviously-underage Nova; after failing to cajole the bouncer, Sun Girl had Aracely use her psychic powers to persuade him, instead. At the rave, she asked Speedball to dance with her, as they might not get another chance - when Speedball asked why, she had a strange episode and told him that Mictlan was rising, and she was going to die soon. She immediately shook it off, however, and danced. (New Warriors V#10) - Hummingbird and the Warriors attacked the High Evolutionary's Arctic stronghold, where he and the Evolutionaries were planning to purify humanity. Hummingbird probed the High Evolutionary's mind, and found that he was waging this campaign because he believed the Celestials were coming to judge humanity. He knocked her away; she then focused her powers on the leader of the Evolutionaries, making him turn on the High Evolutionary. The High Evolutionary fought him off, then killed Mr. Whiskers; as Hummingbird tried to comfort Jake Waffles, the Evolutionary broke from her control and knocked her out. She recovered just in time for the Eternals to join the battle - against the Warriors. (New Warriors V#11) - As the Eternals started taking the Warriors down, one-by-one, Hummingbird tried to challenge their leader, Zuras, in a mental battle. He quickly dispatched her and knocked her to the floor - but while doing so, she learned that Zuras was lying, and the Celestials were not coming. 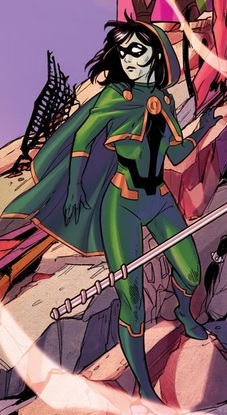 She and the other defeated Warriors (save for Justice, who had been knocked across the world by Makkari) were placed in the High Evolutionary's rebuilt Gene Bomb device; she tried to tell the Eternals the truth, but Zuras dismissed her. (New Warriors V#12) - The machine activated, generating an extinction wave from the Warriors' bodies - but at the last minute, Justice returned, destroying the machine and freeing the Warriors. They took on the Eternals again, this time gaining the upper hand; Hummingbird battled Ajak, instilling him with fear to make him easy prey for the Scarlet Spider. Justice took on Zuras, and convinced the other Eternals that the Celestials weren't coming. He made a quick about-face, and blamed the High Evolutionary for the entire incident; he and the rest of the Eternals then teleported away. Hummingbird and the other Warriors destroyed the Gene Bomb and celebrated their hard-fought victory. (Amazing Spider-Man III#9) - The Inheritor Daemos attacked the Scarlet Spider at Mount Wundagore; Hummingbird and the other Warriors leaped to his defense, but the monstrous extradimensional vampire defeated them all. 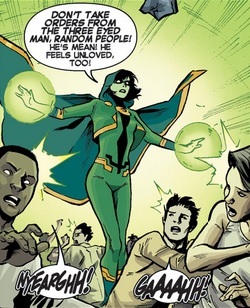 (Amazing Spider-Man IV#21) - Aracely and the others survived the battle with minor injuries, and were recovering well. Their progress was observed by Kaine from Loomworld. (Infinity Wars: Sleepwalker#1 (fb) ) - Rick Sheridan set up an interview with Hummingbird in Brooklyn for his documentary "Secret Defenders", about lesser-known super heroes. Comments: Created by Chris Yost, Ryan Stegman, and Michael Babinski. So, uh, what is Aracely? The High Evolutionary consistently refers to her as a demigod, which typically means the offspring of a mortal and a god (like Hercules, for example), but it appears that both of Aracely's parents were just normal people. In SS #18, the Beast finds that there's something unusual in her brain - specifically, some other entity. It seems that she's possessed by, or is a mortal vessel for, Huitzilopochtli, which has imbued her with divine characteristics. Huitzilopochtli is the Aztec god of the sun, war, and human sacrifice. He hasn't appeared much in the Marvel universe - he was impersonated by Apocalypse at one point, and was on the Council of Godheads when they sent Hercules and the God Squad to battle the Skrull gods. 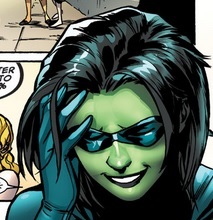 I'm pretty sure she can turn green somehow - it's definitely not a mask, and I can't imagine she's putting green makeup on all the time. I initially blanched at the prospect of a Hummingbird/Speedball relationship, but Speedball probably isn't even twenty yet - he's just been through a lot so he seems older. He's maybe a couple years older than Aracely, but I think they're close enough age-wise that them being into each other isn't too unseemly.